Followers of St Beuno may have established this site’s Christian use in the 7th century. The churchyard’s original perimeter has the rounded form of early Christian sites, and the oldest of the 12 yews encircling the churchyard is more than 800 years old. The oldest surviving parts of the current church probably date from the late 12th century. These are the south wall and part of the north wall – both shaped to resemble a ship’s sides. Inside are medieval stone effigies of a man in religious dress and a knight in armour. Later memorials relate to John Roberts, the clergyman who started the Harvest Festival tradition in Britain, and Hester Lynch Thrale, a writer and friend of Dr Samuel Johnson. While living in Tremeirchion, she wrote her Anecdotes of the late Samuel Johnson, an important source of information about the man who compiled the seminal English dictionary. Dr Johnson visited in 1774 and found Christ Church in “a dismal condition”. There were Welsh-language religious texts on the walls. In one of them, the word ‘carwch’ appeared as ‘curwch’, which turned “Husbands, love your wives” into “Husbands, beat your wives”! The church’s east window was given in memory of Harriet May Owen c.1858. She was the wife of Tremeirchion’s vicar and sister of the poet Felicia Hemans, of St Asaph. In another window are portraits, probably from the 17th century, of King James I, King Charles I and Archbishop John Williams of Conwy, who switched to the Parliamentarian side in the Civil War after being snubbed. 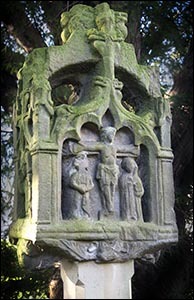 The Tremeirchion Cross (pictured right) stands in the churchyard and is thought to date from the 14th century. A Victorian archaeologist found it neglected under a yew, bought it from the church and gave it to the nearby St Beuno’s College for safekeeping. The college returned it to the churchyard in 2004. The church has a Victorian single-manual pipe organ with six stops. When it was renovated in the 1980s, a ticket was found in the casing dated 19 September 1873 for transport of parts of the organ from the Hill works in London to Bodfari station. The church bell, cast in Wigan in 1778 came by sea to the Clwyd estuary.